It is not uncommon to have a Bengali filmmaker pick on Tagore’s novels as a subject for his vision. Satyajit Ray, Tapan Sinha, and Tarun Majumdar did it. It is not surprising then that one of the most acclaimed Bengali filmmakers of our time also turns to Tagore’s work for inspiration. 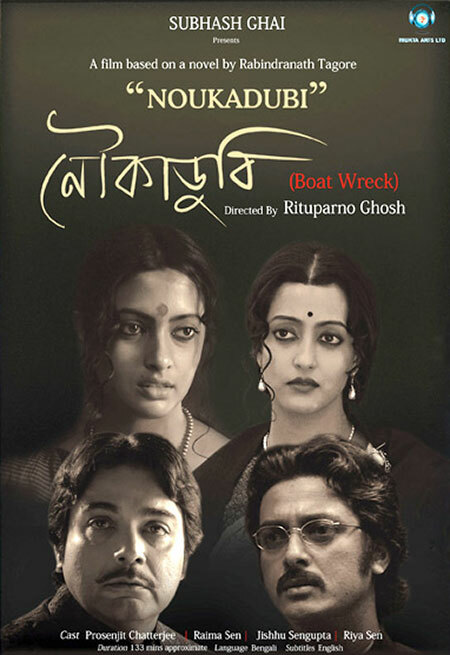 For Rituparno Ghosh, Noukadubi is not his first film adaptation of a Tagore story. However, this particular movie is perhaps one of his most nuanced works. Famous for fleshing out complex human relationships on screen, it comes as no surprise that Ghosh would choose Noukadubi as one of his ventures. The film is rife with such complexities that are characteristic traits of Tagore’s fiction. Yet, it is the simplicity of the retelling of Tagore’s story that holds the narrative together. Ramesh (Jishu Sengupta) and Hemnalini (Raima Sen) are in love. Through the easy banter in which Ramesh writes to Hemnalini, the effortless nature of their love becomes evident. But like every great love story that must face an obstacle of some sort in order for affirmation of that love to occur, Ramesh’s and Hemnalini’s obstacle comes in the form of Ramesh’s father’s desire to have him married to the daughter of a widow. Summoned to his native village suddenly by his father (Sumanta Mukherjee) on the night of Hemnalini’s birthday, Ramesh comes face to face with parental guilt-trip used as a weapon against Ramesh’s own desire for a future with Hemnalini. And even though Ramesh vehemently opposes the decision, he finally succumbs to the widow’s pleas and marries her daughter, Susheela. After a hurried ceremony, the married couple set sail, only to be swept away in an unforeseen storm that washes Ramesh and a woman in bridal finery ashore. Ramesh mistakes her for Susheela and takes her home to Calcutta, and discovers that she is not his wife, but someone named Kamala (Riya Sen) married to a doctor in Benares named Nalinksha (Prosenjit). In this ensuing confusion, Hemnalini is unaware of what has transpired while Ramesh has been away. Ramesh, unable to tell Hemnalini or Kamala the truth, keeps up a charade with both women. However, he asks Hemnalini to keep faith in him, regardless of how the future may unfold. Unfortunately, Kamala’s existence comes to light one day, and Hemnalini’s brother (and Ramesh’s friend) assumes that Kamala is Ramesh’s wedded wife. Unable to face Hemnalini with the truth, Ramesh leaves Calcutta with Kamala. 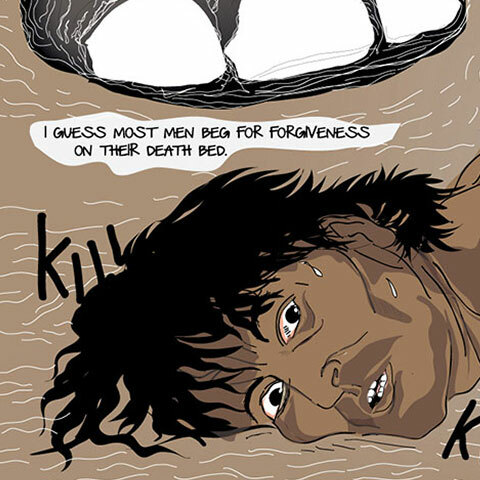 Here, Ramesh’s intentions become slightly ambiguous. Although on one hand, he is portrayed to be intent on locating Nalinksha (through an advertisement that he puts out in the paper), on the other hand, Ramesh develops a soft corner for Kamala. He does not consummate their relationship and yet, he promises to keep her happy for as long as she is with him. At this juncture, Kamala discovers a cutting of the advertisement that Ramesh puts out, and runs away, distraught. Determined to kill herself, she tries to drown in the river that changed her fate, but she is rescued by—hold your breath—Nalinksha’s mother. She takes Kamala to Kashi with her, to the home of her real husband. And what becomes of Hemnalini? Heartbroken, she also lands up in Kashi with her father (Dhritiman Chatterjee) for “a change of scenery”, where she ends up meeting Nalinksha. Their relationship blossoms out of their mutual losses. For Nalinksha, he has waited a year for news of Kamala, while Hemnalini is on the brink of giving up on ever hearing from Ramesh. Their pain brings them closer, and they decide to get married. Kamala, now working as a maidservant in her husband’s house, keeps her silence at her discovery of wedding preparations underway for the wedding of Nalinksha and Hemnalini. However, she occasionally looks at the saved up cutting of the advertisement, and rifles through Nalinksha’s things in his absence, in order to know her husband in any way possible. Ramesh, on the other hand, distraught at having “lost” Kamala, gives up his practice and comes to Kashi in search of Nalinksha. Fate brings him to Hemnalini’s presence, and Hemnalini breaks off her wedding with Nalinksha. At the same time, Nalinksha and his mother discover the newspaper cutting on Kamala, and realise that they had “found” her after all. All is well that ends well, or so it would seem. While the near perfectness of the story brings the four lives together, one must stop and question the idealistic characters of both Hemnalini and Nalinksha. Neither of them questions their better halves, and instead choose love as a reason to forgive and forget. Moreover, the ambiguity of the relationships between Hemnalini and Nalinksha, and Ramesh and Kamala, challenge the sanctity of either love or marriage. Both love and marriage become malleable concepts that can slip in and out of conventions when at the mercy of destiny. Along with Tagore’s music, Ghosh uses destiny as a separate character in the movie that drives the narrative from the beginning to the end. Along with a different era (here, the 1920s), the complexity of romantic relationships come alive onscreen. For example, what struck me most was the way Hemnalini refers to the conversations between her father and her dead mother’s portrait. The references point to an undying love that exists even after many years of her mother’s passing. Of the acting, the only jarring character that stands out in my memory is Hemnalini’s brother, Jogin. His woodenness in contrast to the acting skills of the other veteran actors acts as a repellent. Raima, Jishu, and Prosenjit are brilliant in their main roles, while Riya brings an unexpected freshness to the movie. Even with her dubbed voice, she pulls off Kamala with a finesse that is uncharacteristic of her if one goes by her previous avatars in B-grade Bollywood movies. And although Ghosh received much criticism for choosing to dub Nalinksha’s mother’s voice with his own, personally, I did not find it as obnoxious as it is made out to be. Instead, the dubbed voice is barely noticeable. On the whole, if you are a connoisseur of films that leave a lingering aftertaste like gourmet French wine, watch Noukadubi. Catch the Bengali version if possible, as watching the Hindi version, Kashmakash, is almost like fighting a losing war with annoying dubbing. But being one of Rituparno’s best to date, this movie is definitely not to be missed. In my opinion, of course.